This genuine Angelsounds Fetal Doppler Baby Heart Rate Monitor is the perfect way to listen to your baby's heartbeat right at home. Now all mothers can enjoy the pleasure of listing to their baby's heart right in the comfort of their own home. Many expectant mothers worry about their unborn baby during pregnancy. For these worried mothers, it can be very reassuring to buy a fetal doppler system, especially the popular Angelsounds Fetal Doppler, which comes factory direct from BestMedicalDirect. A Fetal Doppler is a device used to monitor a baby's heart rate throughout pregnancy. The device is non-invasive, which makes it a good safety choice for all pregnant mothers. The heart rate is measured by the doppler effect, emitting and receiving ultrasonic sound waves and monitoring the shift in pitch of the sound waves. Every returning sound wave is measured as the sound of the heartbeat heard through the speakers on the heart monitor. An embryo's heart begins beating around 22 days after conception, but it takes much longer for doctors and parents to be able to listen to the heart beat. Between the 9th to 12th week of pregnancy, most fetal dopplers are able to pick up the sound of the heartbeat. Some heartbeats may be hard to find, and this is perfectly normal. Just be patient and try around more areas of the belly, eventually you will hear it! 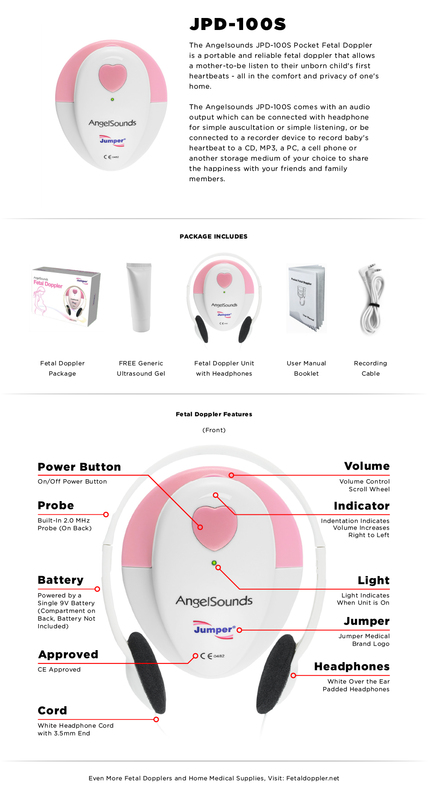 The Angelsounds Fetal Doppler is simple to use. The mother (or father) just press the probe of the device against the abdomen, put on the headphones and turn it on to hear the baby's heart beating. It comes equipped with headphones and a recording cable so that mothers can record the baby's heartbeat to a computer. To record the baby's heartbeat, mothers can plug the recording cable into either of the headphone sockets on the doppler. The other end of the cable should be plugged into the microphone socket on a computer. Mothers can plug headphones into the other socket to listen to the heart beat as it's being recorded. Press the doppler probe against the abdomen and turn the Angelsounds device on. Using recording software on the computer, press the "Record" button, and the computer will begin recording the baby's heartbeat. For users of Windows XP and Win7: You can use sound recorder in the Windows OS to record your baby's heartbeat. Click start, select programs, go to accessory, then select entertainment, and you will see the Sound Recorder application. Can this Doppler heart rate monitor be used on any heart? Yes. Of course the primary function of this doppler heart rate monitor is to be able to listen to a baby's heart beat, but it can still be used to listen to the heart of a child or adult as well. BMP Stands for Beats Per Minute. Does this baby heart monitor come with any gel? No, it works just fine with baby oil or any type of gel body wash.